We start this episode in the Gaming Hut, where we bat around ways to activate your player character’s character hook. In our new segment, Crime Blotter, we examine the four categories of hit man, as proposed by a recent Birmingham City University study of British hired killers. Tropes face off against cliches as we once again tell you How to Write Good. Then Ken dons his Consulting Occultist regalia to tear the lid off the djinn menace. Once again Fenix Magazine occupies the coveted anchor sponsor slot. 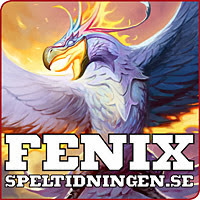 After ten years delighting the Swedish gaming scene, they’re now bringing the Best of Fenix to English-language GMs and players with their now-active Indiegogo campaign. 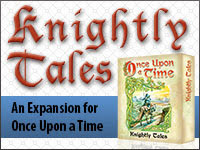 Clank about in chivalric armor in fealty to Atlas Games, now unveiling Enchanting Tales, the exciting new expansion for their classic Once Upon a Time card game. This entry was posted on February 14th, 2014 at 8:30 am and is filed under Podcast. You can follow any responses to this entry through the RSS 2.0 feed. You can leave a response, or trackback from your own site. Ghost Dog – is an excellent film about a hit man, there is even an old RPG supplement about the film (which I’ve not got or taken a look at). Are a djinn’s aberrance points held in a djinn pool? Djinn, better spelled jinn, is pronounced Jin, never Jeen. The initial letter is best pronounced like an English J for classical Arabic, and vernacular Arabics vary between J, Zh like you guys seemed to be popping for, or a hard G.
Crazy is ‘majnūn’ and etymologically it is a passive participle ou can translate ‘be-jinned’, like bedeviled. The `Uwaysi strand of Islamic mysticism does not propose a separate route to heaven, where did you come up with that?? Uwaysism is, in the first instance, the tendency for a mystic to have an initiatory encounter with `Uways al-Qarani the ur-mystic of Yemen, and in the second instance the tendency to take on disciples and form an institutional fraternity exactly like every other Sufi order, but with an initiatory lineage going only to the founding mystic and thence to Uways, and not ‘diluted’ through centuries of shaykhs living here and there across the world. Some Uwaysi groups may well be more heterodox than others, I wouldn’t be surprised, but it’s not what the typology is about. Ken and all interested in Sufi orders should read The Sufi Orders in Islam, J. Spencer Trimingham, which traces the main initiatory lineages up till colonial times. There are a thousand books on Sufism but pretty few on the institution that made mysticism the norm for so long. An academic paper and an exercise in Suppressed Transmissions-style pattern matching. I’m surprised that no one has spoken out about the obvious Jinn conspiracy. Jinn are manifestations of smokeless fire. And what is nuclear energy but smokeless fire? That puts the Iranian nuclear program into a whole new perspective. Now excuse me while I make myself a tinfoil hat. Imbrogno, Philip J. and Rosemary Ellen Guiley (2011) – The Vengeful Djinn: Unveiling the Hidden Agenda of Genies.